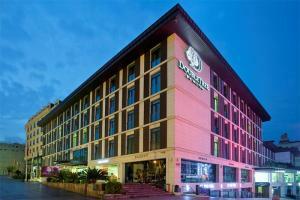 Set in Istanbul's Old Town, the DoubleTree by Hilton Hotel Istanbul extends a warm welcome. With a prime location at the doorstep to the historic Grand Bazaar, the hotel is well located to the vibrant city's most popular attractions. Enjoy the comforts home as you retire to a spacious guest room or suite, stylishly decorated and fully equipped with modern amenities. Head to the fitness center for a workout, or indulge in a luxurious Turkish bath or steam. Enjoy a delicious meal at The Terrace and savor tempting Turkish delicacies and refreshing beverages. This hotel is located 9 miles from Ataturk International Airport, approximately a thirty-minute drive. The Grand Market is just a short walk away.